Are Tiny Houses the Wave of the Future? My idea of roughing it is a night in a Holiday Inn. And one of the complaints I have about the home in which my wife and I raised our two children--in which we still live--is that there really is no place to which I can "get away." Without the doors that used to subdivide the first floors of homes, there's no place on our home's first floor where I can read in silence if someone else wants to watch television. So how to account for my fascination with the Tiny House movement? I mean, here I am lamenting not having more personal space, yet being drawn to the notion of living in a forty, sixty, or seventy-square foot place. My interest in micro-homes began when I listened to an interview on NPR with Jay Shafer of the Tumbleweed Tiny House Company, back in 2005. He described his tiny houses, one of which was his residence at the time, a small home set among the giant California Redwoods. Intrigued, I looked up the company web site and looked over the photos of the various models offered by Tumbleweed. I suppose, in part, the homes appeal to the little boy in me. In my growing-up years, I loved building club houses and forts. Once, I remember, going to a local appliance store and begging a clerk to give me several large cardboard crates in which refrigerators had been shipped. After he complied with my request, I went to a nearby lumberyard and convinced the people there to give me their wood scraps. I used some of the lumber as the internal frame for one box. Then I cut a hole in the bottom of the other one--to act as the passageway to the second floor, nailed the larger pieces of wood to my frame, and stacked it onto the first. .
Later, I covered the whole thing with Saran Wrap I commandeered from the kitchen--unbeknownst to my Mom--in the hopes of saving my cardboard structure from the rain. That didn't work. But for several days, I had a little pad of my own out behind the garage where the garden used to be. An only slightly more practical reason for my interest in micro-homes was the thought that while not living in such a house, it might be a great "place away" out in my backyard, somewhere that I could read and write. I even made a half-hearted attempt to pitch the idea to my wife, who is much more conversant with the limitations of our family finances. "I could get all of my books out of here," I told her. "And that little house might add to the value of this house." But I knew that I was getting nowhere with her, even when I suggested that we might be able to get two tiny houses, one for my study and one for an art studio for her, something of which I've always dreamed. She didn't even go for the idea when I leavened my presentation with a little humor: "They would cut down on how much yard I have to mow, too." Truth be told, the primary market for tiny houses are probably not people trying to add to their possessions. Rather, I'd guess that their appeal is more to people with a well-developed social conscience who love being close to nature. Or people who want to right-size their lives. ...since 1997 I have been living in a house smaller than some people's bathrooms. I call the first of my little hand built houses Tumbleweed...My decision to inhabit just 100 square feet arose from some concerns I had about the impact a larger house would have on the environment, and because I do not want to maintain a lot of unused or unusable space. My houses have met all of my domestic needs without demanding much in return. The simple, slower lifestyle my homes have afforded is a luxury for which I am continually grateful. John Friedman and Kristin Shepherd of Berkeley, Calif., purchased 160 acres in the mountains near Telluride, Colo., it was with the intent to build — just not right away. Before designing a small, ecologically sensitive second home they wanted to spend a year or two visiting the land to determine the most suitable building site. But at an elevation of 9,600 feet, living in tents was out. So, early last summer, Mr. Friedman, 69, an industrial photographer, rented a truck and trailered a pre-built 65-square-foot Tumbleweed Tiny House up mountain roads, into a meadow and parked. To compensate for the lack of interior space, the couple cook, entertain and, for the most part, live outdoors. “We live in our view rather than look at it,” said Ms. Shepherd, 58, a retired youth counselor and an avid hiker. At night the two nestle in a sleeping loft with three feet of clearance, gazing at stars through a skylight. “It’s shelter, pure and simple,” Ms. Shepherd said. Stephanie Arado, a Minnesota Orchestra violinist, said that it took living in a tiny house to learn how little space she really needed. For about $45,000, she bought a 392-square-foot weeHouse with no electricity and no bathroom as the solution to a siting problem on her 32 acres in western Wisconsin. Ms. Arado, who has two children, planned to use the tiny house as a springboard to building something bigger. The tiny-house movement complements another vacation-home trend: buying land with an eye to conservation. John Friedman and Kristin Shepherd will return to their Tumbleweed Tiny House in Telluride this spring, not only to hike, but also to observe wildlife patterns and work to ensure that the land, which they purchased with the express purpose of conservation, remains protected. detached) housing start was on course for a record 2,461 square feet (229 square meters) in 2005. The median multiple unit size was also on course for a record in 2005, at 1,262 square feet (117 square meters). By international standards, Americans live in larger housing and receive superior value for their money. For example, the average new house in the United Kingdom is just 76 square meters, two-thirds smaller than the median US new multiple unit. The median new single unit house in the United States was nearly three times as large as the average new house size in the United Kingdom. Indeed, the increase (more than 80 square meters) in median new single unit house size since 1973 exceeds the size of a new house in the United Kingdom. Australian new house sizes are almost identical to the United States figure. Maybe I should begin thinking about a tiny home not as a place to get away, but as a countercultural way to follow Jesus. A way to downsize and rightsize, remembering that it will be easier for a camel to pass through the eye of a needle than for a wealthy person--and all white middle class Americans are wealthy people by world and historical standards--to enter the Kingdom of God. 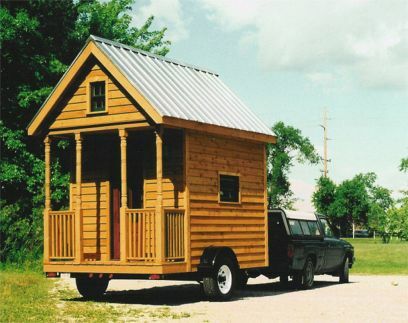 I don't know if I have the guts to try moving into a tiny house. But I wish that I did! (1) Sleep can probably be read both literally and metaphorically. Throughout Luke, chapter 9, there is one moment of cogency, of "being awake." That's when Peter confesses faith in Jesus as, "The Messiah of God." In fact, while Jesus is always the central character of the Gospels, Luke 9 and 10 are really about the disciples, their faint grasping of what it means to follow Jesus, and Jesus directives to them as His followers. How many of us sleepwalk through a lot of our lives, unaware of the damage happening in our relationship with God and other people? We need to be awake, attentive, and prayerful! When we are, Christ can bring healing to our lives and relationships. (2) Fortunately, in this instance, the three apostles did stay awake and so saw this glistening sign of Jesus' deity and Sonship! 33Just as they were leaving him, Peter said to Jesus, “Master, it is good for us to be here; let us make three dwellings, one for you, one for Moses, and one for Elijah” —not knowing what he said. (1) Dwellings can be translated as booths, like those used by Jews even today during the Festival of Booths. This festival celebrates the harvest. But more significantly, it's also associated with the temporary dwellings used by the ancient Hebrews during their wilderness wanderings from Egypt to the Promised Land. This underscores the fulfillment motif of Luke's Gospel that says that Jesus wasn't a departure from historic Judaism, but its fulfillment. First: It puts Moses and Elijah on the same level as Jesus, both equally worthy of our attention. The voice from heaven will soon disabuse Peter, James, and John of this notion: "This is my Son, my Chosen; listen to him!” the Voice says. Second: Peter proposes to capture this moment of epiphany, to capture God. This is the approach of dead religion against which Jesus and the entire Bible warns believers. Faith in the God we know in Jesus Christ can't be boiled down to stale propositions, dead bricks and mortar, stained glass windows, or religious ritual, though each may point us to Christ and a living relationship with Him. These words can be a corrective to our tendency to worship our religion and its props rather than God Himself. I think Peter probably learned this lesson up on the Mount of Transfiguration. I sometimes get concerned about all the money we Christians spend on putting up church buildings and maintaining them. Is it God that we're glorifying or our own righteousness and sanctimony? Or are we, like Peter, trying to capture Christ, hoping that imposing architecture will help us to "feel religious," instead of doing as the Father's voice instructed Peter, James, and John: LISTEN TO JESUS? 34While he was saying this, a cloud came and overshadowed them; and they were terrified as they entered the cloud. (1) More Old Testament allusions here. Beginning in Exodus 13:21, a cloud led the Hebrews during their wilderness wanderings. The cloud was thought to be the presence of God among them, leading them. (2) Of course, they were terrified in the cloud. They knew now that they were in the presence of God. Theologians, as we've noted before, call this numinous awe. There is many an Elijah or Moses to divide our loyalties, but in the end, it is Jesus we must "listen" too; he must be our focus, our Lord. Through his word, read, expounded, studied..... we can take up his life-giving truth and experience its transforming power, preparing us for our reign with Christ in eternity. Therefore, like those disciples of long ago, let us "listen to him." 36When the voice had spoken, Jesus was found alone. And they kept silent and in those days told no one any of the things they had seen. (1) Until later, when the cross and empty tomb made sense of it all and the Holy Spirit gave the Church the power to tell the world about Jesus! 28Now about eight days after these sayings Jesus took with him Peter and John and James, and went up on the mountain to pray. (2) these sayings: The phrase translates Luke's Greek narration, which literally is these words. (3) According to Mark, there's a six day gap between Peter's confession/Jesus' words and the Transfiguration. I can't explain the difference. As with many resurrection appearances, 24:1, 13, 33, eight days symbolizes entrance into a new age, a new creation following the seventh day of God's rest. The phrase may signal that in the midst of Jesus' passion (and predictions of it) and the weakness of the disciples, Jesus will ultimately prevail and establishing a new creation. (4) Over the past several weeks, our Bible lessons from Luke have shown us that there were various audiences who listened to Jesus with varying levels of attentiveness and who followed Him with varying levels of devotion, for varying motives. Now, we see that there was an inner circle among the apostles, those who were to lead the leaders: Peter, James, and John. Jesus takes this inner circle with Him to a mountaintop. During His earthly ministry, Jesus spends the greatest amounts of time with the inner circle, the least with the crowds. Discipleship entails moving closer to Jesus, while continuing to be in touch with the crowds, asking God's help in moving them closer to Jesus as well. This is the dual mission of the Church. (5) to pray: Luke emphasizes that every major event or initiative by Jesus is always preceded by times of prayer. Here, Jesus' prayers come before a great epiphany (or theophany) displaying Jesus' deity. 29And while he was praying, the appearance of his face changed, and his clothes became dazzling white. 30Suddenly they saw two men, Moses and Elijah, talking to him. (1) Moses and Elijah represent the twin pillars of the Old Testament Scriptures: the Law and the Prophets. Moses was the law-giver. Elijah was Israel's greatest prophet. Throughout the two New Testament books authored by Luke, the Gospel from which our lesson is taken and Acts, he points out that Jesus' life, death, resurrection, and the new life He gives to all with faith in Him, fulfills the Law and the Prophets. Only Luke uses the phrase "two men" (vv. 30, 32). This most closely relates to the "two men" who are sitting in the empty tomb in dazzling clothes (24:4). If you see the Transfiguration within the context of events recounted by Luke in chapter 9, it seems clear that his decision to speak of "two men" of Moses and Elijah here and of "two men" of the angels at the empty tomb, you see that he means for this account to be an oasis of hope amid the foreshadowing of Good Friday and the discussions of the demands of discipleship. 31They appeared in glory and were speaking of his departure, which he was about to accomplish at Jerusalem. (1) The word departure is interesting here. Both Moses and Elijah were well-known for their departures. Moses led the people of Israel out of slavery in Egypt. Elijah, according to the Old Testament, didn't die, but departed from the world on a chariot of fire. The departure referred to here is Jesus' crucifixion. is another artist worth listening to...alot. may become famous, even if she understands how unimportant it really is. 2. Every year, the Gospel lesson for the first weekend after Epiphany, whether taken from the Gospels of Matthew, Mark, or Luke, is about the baptism of Jesus in the Jordan River by His relative, John the Baptizer. Each of those three accounts, in their own peculiar ways, see Jesus being affirmed as the Son--the very reflection--of God by a voice from heaven. The season is always capped by either Matthew's, Mark's, or Luke's accounts of Jesus' transfiguration (the alteration of His appearance) in the presence of three apostles: Peter, James, and John. In them, as in the accounts of Jesus' Baptism, a heavenly voice affirm Jesus' Sonship, as well as the need to listen to Him. 3. During the week following Transfiguration Sunday, we come to Ash Wednesday, the first day of the Church's season of Lent. Lent is the run-up to Easter. The length of the Epiphany season each year is shortened or lengthened by when Easter happens. Easter is what's called a movable feast, as opposed to Christmas and Epiphany day, the dates for which are fixed at December 25 and Januray 6, respectively. Because Easter falls on April 8 this year, there are two less weekends after Epiphany this year than there would be if Easter came in the latter part of April. 4. 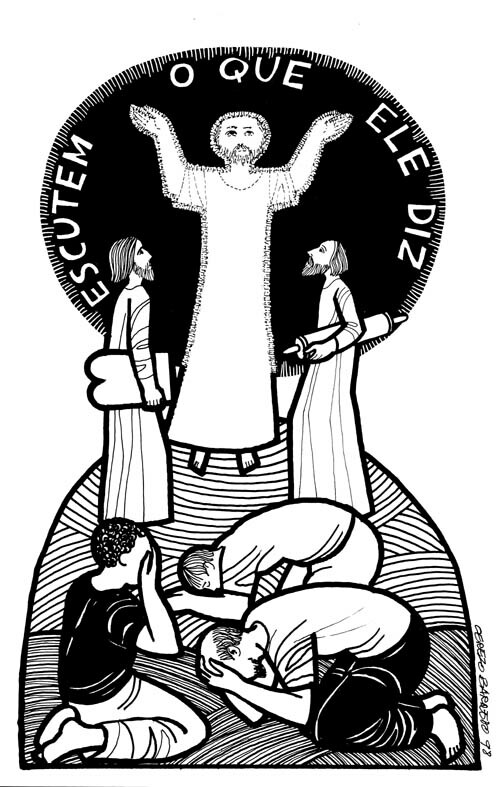 This Roman Catholic resource has information on the Transfiguration. 5. Once again, we return to one of the key principles for understanding a given passage of Scripture: context affects content. Preceding our text in Luke's Gospel, Peter confesses that Jesus is the Messiah of God. Jesus affirms this, but orders him and the other apostles not to tell anybody for the time being. (We'll talk about why Jesus gives this directive when the text comes up later.) Jesus then tells the apostles what is going to happen to Him--cross and resurrection--and warns them that following Him in this world won't always be a picnic. Immediately following our lesson, Jesus and the three apostles ascend from the mountain where the nine remaining apostles proved incapable of exorcising a demon from a boy. Jesus performs the exorcism. By Luke 9:51, we find Jesus resolutely moving toward Jerusalem, where He knows that He will be crucified. In the midst of the chaos then, Jesus' glory as God and Messiah is manifest on the Mount of Transfiguration, a dazzling moment of promise in the midst of humanity's sin and the inexorable movement toward the death of humanity's Savior, Whose face is set for Jerusalem. 6. This then, is the fault line or the turning point in Luke's telling of the story of Jesus' life, death, and resurrection. While opposition to Him has been gathering up to this point in Luke's Gospel, it's been a period when He has, by words and actions, demonstrated His identity as Messiah and God. Now, with determination. He begins to unpack what it means to follow Him, opposition to Him increases, and He moves with determination to His cross. I'll be praying that it works out for him. Matt Brown says that he loves the Grand Canyon. But the next time he goes back, he doesn't plan on looking at it through a new glass sky walk that will jut out from the rock face, literally giving one a bird's eye view of the canyon. I love to fly. (I'm especially mad-keen for take-offs and landings!) I love climbing to the tops of landmarks like the Washington Monument, the Empire State Building, or the John Hancock Tower. But I think that I would take a pass on that glass walkway myself! Several years ago, my family and I, including my then-seventy-four year old mother-in-law, went to Mesa Verde in Colorado. It was spectacular! And I was impressed by the m-i-l's gameness and physical agility. But I have to say that it gave me the willies to walk as closely to 8000-foot dropoffs as we did. My palms are sweating all over the keyboard just writing about it. Anthropologists say that the most ancient of human fears is that of falling. Students of the brain say that may explain why people's most frequent recurring dreams is about falling. My personal experience tells me that's so. The only recurring dream from my childhood that I can remember is one in which I stumbled, out of control, down creaky basement steps on a dark stairway that seemed to go on forever. Isn't it interesting, too, that when describing humanity's alienation from God, beginning with Adam's and Eve's rebellion, we've always used the term, 'the fall'? Maybe that's what frightens us so much about heights, an old memory of a bad decision. That, and the fact that the combination of height and gravity can have negative consequences for the human body. Can you say, "Splat"? serving as a member of the Clermont County Board of Mental Retardation and Developmental Disabilities. We recently were sworn in for 2007. Here's how The Cincinnati Enquirer shared the story. Richard Lawrence Cohen has sauntered, leisurely like, back to bloggin'. Yeh c'n read his wonderful piece, The Adagio Kid, here. But tek it kinda slow. Richard is absolutely one of my favorite bloggers. As he explains here, he's approaching things a bit differently this time. But Richard, being Richard, shows in his first two return posts that he remains a wordsmith of wit, insight, and candor. Treat yourself by going to his site now. A recent article in the magazine, Sports Spectrum, says: “He cleaned, scraped, then painted a bathroom in the home. In the evenings after a day’s work, he’d join the lepers for song and worship. It was then that [he] met George McVee, [a] man disfigured by leprosy. That first evening, [the college athlete] was the last to arrive and only one chair remained. It was next to McVee. “’I’m ashamed to say this, but it was hard to look at him,’” he recalls. “’I didn’t really want to sit next to him. His leprosy was so much worse than everyone else’s. They said it wasn’t contagious, but I was a kid. I didn’t know.'" Once the young man was seated, George McVee, the man disfigured by this horrible disease, who had lost his forearms, held a harmonica to his mouth with his remaining stumps. He played songs of praise to God. All around the room, accompanied by McVee’s harmonica, voices emanating from aged bodies being destroyed by leprosy joined together to worship God. “In between songs, McVee...[recited] long passages of Scripture and poems he had composed. One of his poems he called, ‘My Cup Runneth Over.’” In his affliction and desperate poverty, McVee still regarded himself as a blessed man, all because of the God we know in Jesus Christ. The young man saw a lot of other things on that trip to Jamaica. And the thing that struck him most was how faithful and how joyful the people he encountered in Jamaica were. It was then that sophomore Matt Hasselbeck, who would go on to play in Super Bowl 40 in 2006, “made a promise to God.” He first apologized to God for not being all that he could be and told the Lord that in all departments of his life, he would always try his hardest. Second string, practice squad, also ran, whatever, he would always do his best. Hasselbeck says that it was not only the moment that changed him as an athlete, but also the moment that changed him as a human being. And it all happened because of the faith and joy he saw in people suffering from the worst poverty and disease, people the world would say had nothing. But Hasselbeck knew that the world was wrong: George McVee and the others he met had Jesus Christ! Today’s Bible lesson begins a section in Luke’s Gospel in which Jesus delivers what’s called, The Sermon on the Plain. It has a lot in common with the more famous Sermon on the Mount, found in the Gospel of Matthew. You’d expect to find similarities in them; after all, Jesus was the preacher in both cases. But I’ve sometimes wondered, why is the sermon in Matthew more quoted than the one in Luke? Both are equally beautiful and important. I think I know the answer: In the Sermon on the Mount, Jesus says, “Blessed are the poor in spirit.” In our lesson today, Jesus says, “Blessed are the poor.” Jesus was saying: Blessed are the George McVees, the elderly lepers in Jamaica, the homeless in downtown Cincinnati, the destitute in New Orleans, the fleeing refugees of Darfur, the orphans in Iraq, the military veterans of America living on the street. This is a jarring thought, this notion that those who have nothing of the world’s wealth are blessed by heaven. We’d much rather quote Jesus’ words from Matthew and speak of ourselves as “poor in spirit.” (I know that I would.) To be poor in spirit sounds less specific, like a description of people who are, well, just like us...you know, humble, kind, nice folks. But when Jesus says, “Blessed are the poor,” it may make us feel left out. I know that I do. My wife and I are by no means wealthy. But we raised our kids in two different houses, one in northwest Ohio and the one in which we’ve been living for the past sixteen and a half years. Both houses are much larger than the homes in which I grew up. And my parents raised five of us in them! Five kids in a house with one bathroom and two bedrooms, one of which my dad subdivided. For much of the first twenty-two years of their marriage, my folks had to sleep on hide-a-beds to make room for all of us. Yet, my parents and our family in those years wouldn’t have fit under the category of the blessed poor Jesus describes in His words today. We were strapped, to be sure. And my Dad worked two full time jobs for a chunk of my childhood. But we never lived in grinding poverty. And few of us in white middle class America ever have! a life that will never end. They lived in the tattered rags of horrible poverty, their bodies deformed in ghastly ways. Yet they knew that the God of the universe cared for them, empowered them to face pains and hurdles few of us can imagine, and allowed them to look with joy to an eternity in which they would live with their Lord! We should be so poor! Jesus, of course, isn’t saying that only the poor can have a relationship with Him. Nor is he saying that the poor aren’t sinners. Salvation is still a matter of sinful human beings--and that’s all of us--turning from our sin and trusting our whole lives to Jesus Christ. That’s true whether we have money or not. But the poor have less of the stuff of the world, the medical care, the clean water, the luxury items that allow you and me to pretend, sometimes for decades, that we’re not mortal, not vulnerable, not in need of God. The poor have a much easier time knowing how much they need God! So, where does that leave you and me, we, the world’s wealthiest people? Just before our lesson, Jesus had called the twelve apostles. It happened up on a mountaintop. We all love the mountaintop. But Jesus calls us to go to the level places, to live among and to share with those of all economic conditions. He calls us to love our neighbors in practical ways: to donate coats for the homeless; to give gifts to children in Third World countries; to help build homes for the homeless. He calls us too, to fill the empty hearts of those suffering from the ultimate poverty, a life without Jesus Christ. All around us are people hungry for Jesus Christ, spiritually disconnected people who need the Savior. They need someone wealthy with the riches of heaven--someone like you and me--to bless them by telling them the Good News of Jesus Christ. The life of the Church, the continuing life of this congregation, depends on our willingness to tell others about Jesus and to invite them to worship with us. But more importantly, we have been commanded to make disciples. How many disciples will you and I allow God to make through us this year? With how many people--wealthy or poor--are you and I willing to share the Good News that can allow a person to live with God forever? You know, a funny thing happened to Friendship Church. I remember that in our early years, we had nothing: no sanctuary, no classrooms, no place for our youth to gather, no rooms for meetings or dinners. 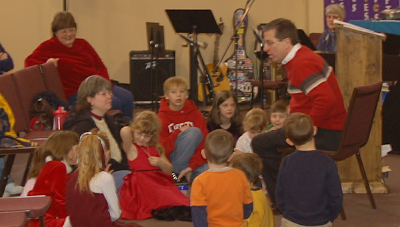 Yet, for all the things we lacked, we did have a passion for telling others about Jesus. But since we moved into our building, we seem to have grown passive. We are a praying church. We are a serving church. And both of those things are marks of people who follow Jesus. But we aren't reaching out to others as we need to. We're not inviting others to worship with us as we need to. We're not telling others about Jesus as we need to. And I am as guilty of this oversight as anybody else! It's great that we serve others in Jesus' Name. But we also need to be willing to tell others why we serve in Jesus' Name. We need, as I told the Church Council the other evening, to "close the sale": We need to let others know about the Savior Who motivates and empowers our serving and gives us confidence for living this life and for facing the one to come! From today, let's change the way we've been thinking and living. Let this be the first day of a new life at Friendship! I hope that each of us will make it our goal to invite at least one person to worship each month and to make at least one disciple before the end of this year...and every year! We also all need to take responsibility for telephoning or emailing the people we haven’t seen in worship for awhile. People expect to hear from the pastor, the hired hand, when it comes to inviting people to worship or to check on how folks who haven't been around for awhile are doing. But when you do these things, your simple gestures of love have tremendous impact! We have so much to give--to the poor in money and the poor in spirit. Let’s make a vow this day that like Matt Hasselbeck, we will do our best every day for Jesus Christ! Let’s share the riches of heaven with everybody--in word, in deed, and in telling the good news of Jesus.